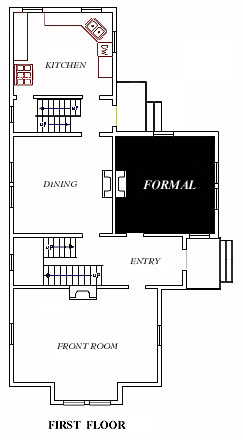 This First Floor Room has Large Windows on Three of its Four main sides. As with all Rooms on the first floor the ceilings are 12' high and feature a white cornice all the way around. The hand painted chandelier is Original 1800's. When this home was first built it would most likely have been used to greet guest and entertain, with views to the Entrance Garden and Back Patio. This is a Large room at 15' x 15'. The Monthly installment for this unit includes all Utilities paid.